The incredible Allyson Brian of the Lime Valley Mill shared this recipe with me, and it’s a drop-dead winner. Allyson and her henchmen (henchpersons?) appear yearly at the Landis Valley Herb & Garden Faire, and this year (2012) is no exception. Thanks, Allyson, and Mangia! On a clean countertop, create a mound with the flour, hollowing out the center. Crack the eggs into the mound’s center and then work together with your hands. Knead for about 10 minutes or until the pasta dough is thoroughly mixed and a uniform yellowish color. Add a small drop of water (a little goes a long way) if the dough becomes too dry. If too sticky, add a sprinkle of flour and work some more. Dough should have a small bounce-back elastic effect when you press it down flat. Put dough, covered, into the refrigerator for 10 minutes. In a large pan, add olive oil on medium heat. Add garlic and lamb and lightly brown without thoroughly cooking the meat. Add cooking greens and let wilt. Reduce heat to low, and add chicken stock, rosemary and salt to taste. Let simmer for about 5 minutes or until meat is medium (pink), then turn off the heat. Add all of the contents (saving some juice to serve later) into a blender or food processor and mince the filling until it is fine enough to shape into patties in your hand. When ready, remove dough from refrigerator and roll the dough in portions until the pasta is thin enough for you to just be able to see your hand through, about 1/8-inch thick. If you’re using a pasta making machine, roll thedough down to 2-thickness. Generally, you should start at 7-thickness and work your way down in 1-thickness increments. Cut the dough into 2 1/2 inch squares or circles. Place a spoonful of filling in the center of half the pasta pieces. Brush the edges with melted butter and place the remaining squares on top. Seal the edges by pressing them with a fork. If they are not sealed well, the filling will escape when they are cooked. Bring a large pot of salted water to a boil. Add the ravioli a few at a time, make sure not to crowd the pot. 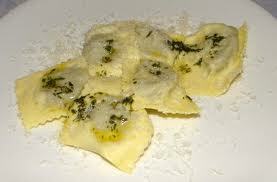 Cook for 3-5 mins, until the ravioli floats and changes to a whiter color. Drain. 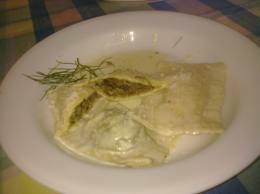 Serve with butter, the leftover juices from the filling cooking and freshly grated Parmesan cheese. Or, deglaze the pan you used for the filling with a few tablespoons of chicken stock, then add 2 tablespoons butter and 2 tablespoons all-purpose flour, stir until combined, then add 1 1/2 cups more stock, and simmer until the sauce thickens. Serve with this white sauce and freshly grated Parmesan.